Olamide took a little different route to introduce the new YBNL rapper ‘Davolee ‘ to his fan base. He posted a video on Facebook where the new signee was rapping as YBNL in-house producer Pheelz played on the keyboard. 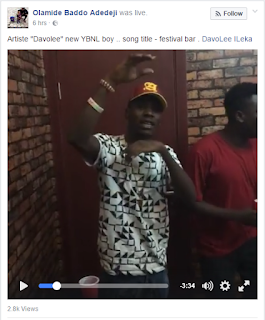 Davolee rapped in the video in the midst of Olamide, Pheelz and other unidentified males, song title ‘Festival Bar’. Viktoh did not renew their contracts with YBNL after it expired. The new rapper maintains the YBNL primary genre ‘AfroHip-hop’ as raps in his native Yoruba language.